Five candidates currently running for Baltimore County executive—state Sen. Jim Brochin (D), former state Del. Johnny Olszewski Jr. (D), Councilwoman Vicki Almond (D), state Del. Pat McDonough (R), insurance commissioner Al Redmer (R)—­­­fielded questions at the Community College of Baltimore County - Catonsville, last Thursday, April 26. 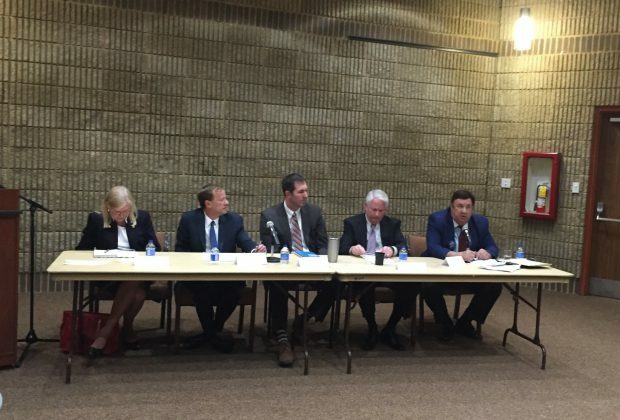 The candidates—except Vicki Almond—had met for a forum once before, at CCBC -Catonsville, in November 2017. John Dedie, a professor of political science at CCBC, organized both events and acted as moderator on both occasions. Kevin Kamenetz, the current Baltimore County executive and 2018 Maryland gubernatorial candidate, recently proposed the Baltimore County College Promise program which, if approved by the County Council, would cover tuition and fees for recent high school graduates attending CCBC. Qualifications would include a minimum grade point average of 2.5 and a gross adjusted income below $69 thousand, according to the CCBC website. When asked if he would continue this scholarship program as County executive, Olszewski Jr. answered affirmatively. Olszewski Jr. says a full audit of the Baltimore County Public Schools and CCBC budgets, which would ostensibly uncover “waste, fraud and abuse,” is necessary to find funds for the program. McDonough says, “the program is not a practical idea,” and “in my opinion, elitist,” since it would not provide financial aid for those looking to join the workforce in a technical field immediately following high school. McDonough referenced private sector scholarship programs, which involve job training and do eat away the County budget, as a positive alternative. Redmer and Almond both commented that major issues currently plaguing BCPS, like dilapidated facilities and personnel shortages, must be addressed before such a program could be economically feasible. Redmer went on to say that, “we need a total revamping of Baltimore County Education,” which would include a curriculum overhaul focused on career oriented courses. McDonough and Brochin agreed, the former advocating the creation of an advisory commission comprised of retired teachers to better inform the County executive on current problems, and the latter emphasizing that technology purchases, such as individual laptops for elementary schoolers, divert funds that could be better allocated elsewhere. According to Brochin, BCPS spends more money on laptops than any other public school district in the United States. Olszewski Jr.—a former Patapsco High School teacher himself—said that he would support a 20 percent pay raise for teachers and the establishment of an independent board to oversee BCPS expenditures, to prevent another major scandal in the future. Dallas Dance, the former BCPS superintendent, was recently sentenced to six months imprisonment after being convicted on four counts of perjury. Dance was, according to the Baltimore Sun, receiving a consultant’s salary from several technology companies which were awarded no-bid contracts, and were paid millions for tablets and computers, by BCPS. When asked how they would deal with the potential threat posed by mass shooters, McDonough, Brochin and Redmer asserted that all elementary, middle and high schools must be outfitted with their own Student Recourse Officer. None of the candidates mentioned security at CCBC. “Traveling SROs are not enough,” Brochin said, in response to Almond’s school security proposal which would entail the sharing of SROs between elementary schools. Olszewski Jr. argued that automated security systems, such as interior locking classroom doors, would be a more effective security measure than armed police. Brochin and Almond further quarreled over the extent of the County executive’s jurisdiction in regards to public education. “We have a school board to take care of these issues,” Almond said in response to a question about BCPS superintendent, Verletta White’s, policy making. “This is an executive function,” retorted Brochin, who feels that BCPS board meetings need to be open to the public. And when Almond said that, “we can’t stop development in Baltimore County,” Brochin touted his past successes thwarting multi-use development of green spaces and parks, such as Lake Roland, while serving as a state senator. Brochin also assured that, if elected, he would push legislation barring campaign donations from developers to local government candidates. Olszewski Jr. says he would take things a step further and ban special interest donations altogether. Though disagreements on some issues arose, candidates agreed on more issues than not, and all seemed imbibed with McDonough’s, “put Baltimore County first,” spirit, especially when unanimously declaiming the construction of a third-span of the Chesapeake Bay bridge, which would connect Baltimore and Kent counties, and “benefit no one except Ocean City,” says McDonough. Dedie says he will invite the two County executive candidates who receive their party’s nomination back for a final round of debate, in the fall of 2018, before the Maryland general elections in November. Voter registration and party affiliation deadlines are June 5, with the Maryland primary being held later that month, on June 26. Whichever candidates you support or party you affiliate with, stop taking our representative democracy for granted and go cast a vote. I feel like not enough people pay attention to their local elections. There a very important part of our community that is essential to the shape of our future. Great job on the video! It highlights the most important aspects of the article and provides visual representations of the people and stats referenced in the text. Very helpful for capturing an audience! I think it’s great that they are going to CCBC to actually talk to people.I agree that security definitely needs to be heightened. When I was in high school in 2015 which was not really that long age all you had to do was knock on the back door and a student was there to open it. So I think security should be at every entrance all the time. It’s great that they’re offering free school because a lot of kids in Baltimore cannot afford school so a free education at CCBC is a good start. The music kept me engaged, it had all the important information from the article and was very aesthetically strong. Love the video, its a quick way to get the main information and pulled me into the article. This is important because while federal elections have the most drama, the local ones are the people that touch our lives each and every day. Thank you for reporting on an important event. The security in schools has been an important matter during several years. With increasing shootings and politicians being reluctant to take actions, we must be aware about the politicians we are voting and electing, because our needs as citizens must be heard and solved. The video captures the essential information regarding the running politicians. A great source to identify which is the people we are voting and avoid being influenced by the one who pays for more ads and billboards. It was great that you covered many parts such as gang and crime violence, failing infrastructure, and also the education. The free tuition for students really opened my eyes. Education is a great priority in our lives and if students can not afford it then they hit a major wall in their lives and greatly affecting their future! Great job Alyssa! Having everyone vote and realize the tremendous impact that they have over their county is very important. I feel as though your video outlined issues that many have concerns about and casting their vote is one way to make their voices heard and expect change. This article was very thought out and detailed I like how your video stated extra facts in order to motivate younger people to vote. Who we put in office can change our world and we need more people that is changing the world for the good and not the bad. Great topic to talk about, it is very important more people know who they are electing to help our community. Also, love the idea that they are giving the opportunity to kids who cant afford school to get an education. it will benefit many peoples lives and their future. The video was very good as well really showed off the important parts of the article and helped understand it better.